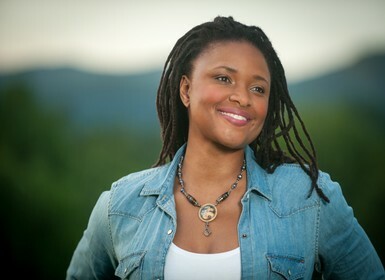 Acclaimed vocalist Lizz Wright is a steward of American music bringing brilliant color and vibrancy to singular original works and compositions by some of the greatest songwriters of our time. Wright has garnered widespread attention as one of the most venerable popular singers of her generation through the release of five critically acclaimed albums. From her breakout Verve debut album Salt to her latest album GRACE, Wright lives life filled with beautiful possibilities centered on the power of song. Through an inimitable voice that The New York Times touts as, “a smooth, dark alto possessed of qualities you might associate with barrel-aged bourbon or butter-soft leather,” Wright sings with a soaring reflection of the cultural fabric of America. She lies beneath the script of human history transcending social divides with an offer of love and deep sense of humanity. Her music accepts the beauty of reality and a collective experience of belonging. For the listener, Wright’s songs embody a tradition that allows us to always feel at home, wherever we might be physically or emotionally. Wright culls inspiration from her Southern upbringing in Georgia where she was the musical director of a small church in which her father was the pastor. Gospel music, and the call and response singing with the church congregation, informed her first brushes with music. Singing classical repertoire with Dr. Dwight Coleman while attending Georgia State University (Atlanta), studying jazz and spirituals with Dr. Richard Harper of The New School (New York), personal study of the folk tradition, and traversing through the Great American Songbook all fostered a keen interest to discover her own voice across diverse genres. At the age of 22, Wright made a name for herself nationally as a vocalist with a touring concert tribute to Billie Holiday, where her poised performance stole the show. At 23, she signed with Verve Records for the release of Salt, which topped Billboard’s contemporary jazz charts. Her subsequent albums (Dreaming Wide Awake, The Orchard, Fellowship, and 2015’s Freedom & Surrender) continued to top the charts and her latest single “Lean In” (from Freedom & Surrender) landed on President Obama’s 2016 Summer Playlist. NPR critic Ann Powers included Freedom & Surrender on her list of “Favorite Albums in 2015,” and the album has received rave reviews from The New York Times, Wall Street Journal, and many other publications. Dedication to the long form and the cultivation of a balanced life with strong roots has brought Wright from New York City to the countryside outside of Asheville, North Carolina. A respite from the bustling city streets, the beautiful mountain woods provide the perfect backdrop for her writing. Rustic hikes and river swimming, living amongst lovers of the land, growing essential foods in the garden, and harnessing an appreciation for the earth. Wright lives and breathes with the freshness of the country air. In turn, her music remains vital and dynamic growing along with nature’s elements. Wright’s full-length studio recording GRACE reveals the web of deep running roots of story and song that bind together the vastly diverse traditions that are the soul of the American South. Produced by Americana icon Joe Henry, GRACE features an expansive collection of 10 covers and an original co-write with Maia Sharp. Wright offers singular arrangements of music by Ray Charles, Allen Toussaint, Nina Simone, Sister Rosetta Tharpe, k.d. lang, Bob Dylan, Frank Perkins and Mitchell Parish, as well as emerging artists Rose Cousins and Birds of Chicago.